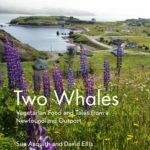 Two Whales is a small, independent coffee shop and restaurant overlooking Robin Hood Bay in the small township of Port Rexton on the Bonavista Peninsula. This is our 10th season in business and our reputation grows every year. We serve delicious, healthy vegetarian and vegan food and yummy cakes. We use as much organic and/or locally sourced ingredients as we can, make and bake just about everything ourselves in our own kitchen and take great care in what we do. We also grow a wide variety of organic salads, vegetables, herbs and flowers in our own gardens. Read more about us.